Douglas Stone and Sheila Heen have spent the past fifteen years working with corporations, nonprofits, governments, and families to determine what helps us learn and what gets in our way. 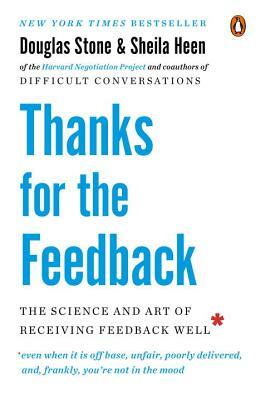 In Thanks for the Feedback, they explain why receiving feedback is so crucial yet so challenging, offering a simple framework and powerful tools to help us take on life’s blizzard of offhand comments, annual evaluations, and unsolicited input with curiosity and grace. They blend the latest insights from neuroscience and psychology with practical, hard-headed advice. Thanks for the Feedback is destined to become a classic in the fields of leadership, organizational behavior, and education. DOUGLAS STONE and SHEILA HEEN are lecturers on law at Harvard Law School and cofounders of Triad Consulting. They both live in New England. "Thanks for the Feedback is an extraordinarily useful book. It's full of helpful techniques that can be put to use by anyone seeking to manage an organization, lead a team, engage a business partner, or navigate a relationship.... Stone and Heen have done a remarkable job of showing individuals and organizations how to leverage the enormous value of feedback, one of the most powerful instruments available for human learning." Surprisingly little attention has been focused on being an effective recipient of feedback. Enter Stone and Heen with a well-rounded consideration of "the science and art of receiving feedback well.” As they write, both of those disciplines are required to receive feedback in productive ways—not only in the workplace, but in personal life as well....the authors do an excellent job of constraining the applications to feedback usefulness while also exploring some of the other ways we can define what "feedback" consists of in our lives. With a culture increasingly focused on the individual and the self, this book on developing the ability to accept and utilize the input of others constructively deserves a wide readership. "I'll admit it: Thanks for the Feedback made me unconformable. And that's one reason I liked it so much. With keen insight and lots of practical takeaways, Stone and Heen reveal why getting feedback is so hard -- and then how we can do better. If you relish receiving criticism at work and adore it in your personal life, then you may be the one person on earth who can safely skip this book." "Thanks for the Feedback is a potentially life-changing look at one of the toughest but most important parts of life: receiving feedback. It's a road map to less defensiveness, more self-awareness, greater learning, and richer relationships. Doug Stone and Sheila Heen have delivered another tour de force." "Imagine an organization where everyone is actually good at receiving feedback. Collective anxiety would be reduced. People would learn and grow. Impossible you say? Thanks to this insanely original and powerful book, maybe not." "Startlingly original advice for how to make feedback truly useful." "If you want to lead a learning organization, improving the quality of feedback is job one. This book is an essential guide to making that happen." “Learning and HR professionals aren’t the only ones who will love this book. It should be required reading for anyone receiving a performance appraisal -- and anyone who is striving to improve." ~B. Alan Echtenkamp, Executive Director, Global Organization and Leadership Development, Time Warner Inc.